In this article, I will be discussing briefly but with just enough detail if technology M&A has recovered from the financial crisis of 2008, short and long term trends from my own perspective. 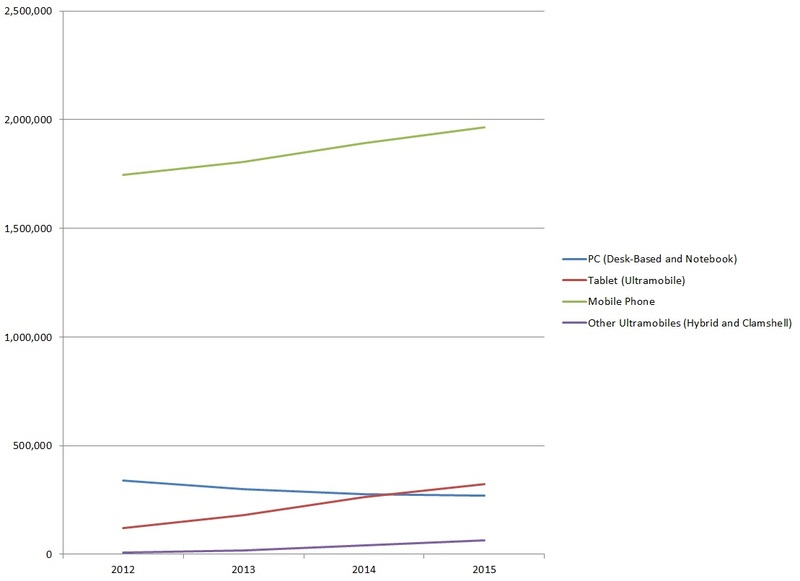 What happened to technology M&A? This in turn led to annual and first quarter announced technology M&A values respectively decreased from $146.8 billion and $40.2 billion in 2008 to $124.35 billion and $9.45 billion in 2009 (2)(3)(4)(5). This is because of falling confidence in the global economy so many technology companies held back their business plans until they made were sure things were on the mend. Details of the calculation of the values are found through this link. 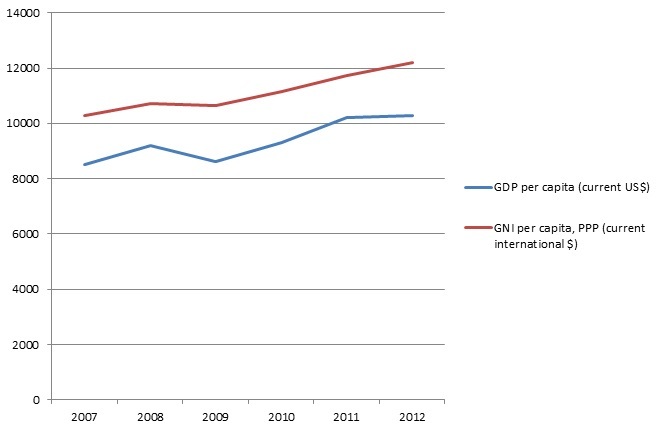 Global inflation has remained quite stable from 2009 onwards after a sharp drop from it’s 2008 peak (9)(10). This provided a relatively stable economic environment to encourage investment. 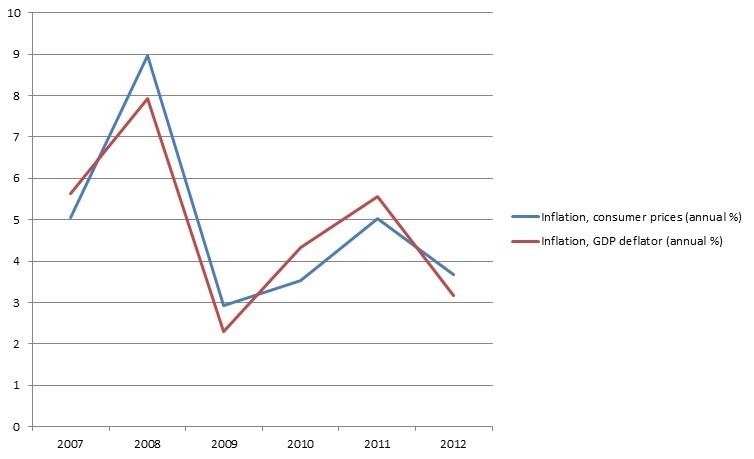 Global inflation. Source: World Bank. 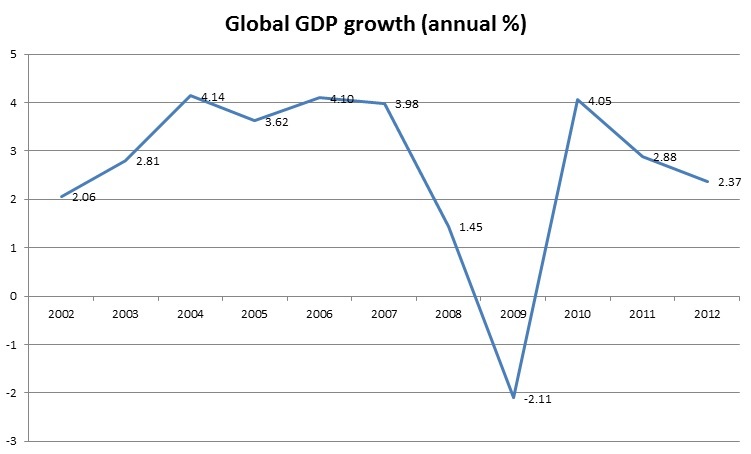 After the financial crisis has slightly dented global earnings and income per person, the global economy has continued to grow from 2009 because major developing economies such as China took appropriate actions at the time to keep theirs running at an astonishing speed (11)(12). Efftec International acquired BitBank application in January 2014 to expand it to achieve their goal for it to become the first source of information for Bitcoin and other digital currencies (41). 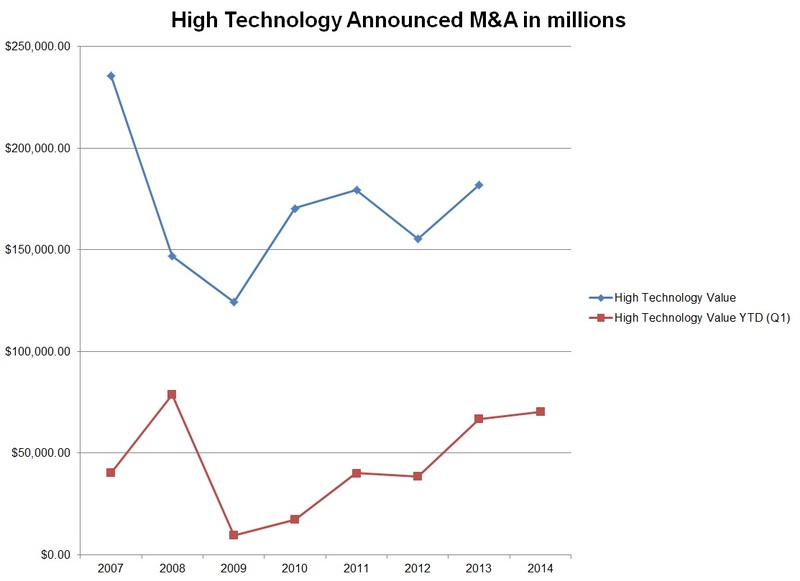 Where might technology M&A go in the future? Global technology M&A activity in terms of value will rise as the global economic climate improves when many developed economies currently trying to lower their debts, such as Greece and Italy, start to recover. However, M&A may rise a little slower because of China’s economy developed fast due to the bank sector expanded very fast. The government is trying to figure out how to shrink the sector without affecting economic growth too much. 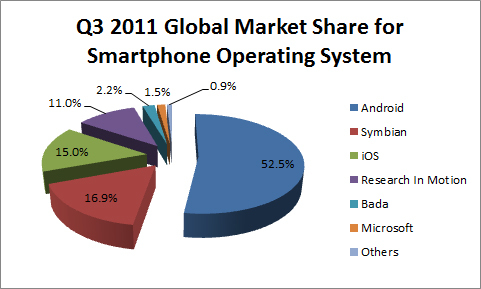 M&A activity in the smartphone market may go up because smartphone manufacturers want to dominate the market through various means such as new technologies and various smartphone models to suit different types of consumers. Social media M&A activity may increase because major players, such as Facebook and Google, are still racing to the ultimate goal of helping everyone connect with each other no matter where they are in the world, providers want to find new ways to help people express themselves and communicate with others online, and some want to find new ways to collect even more data from people, from their own will, and increase profits from advertising. Bitcoin and 3D-printing M&A may rise slowly as the society slowly adapts to new technology, overcome fears of associated with these new technologies and the cost of 3D-printers fall even further. 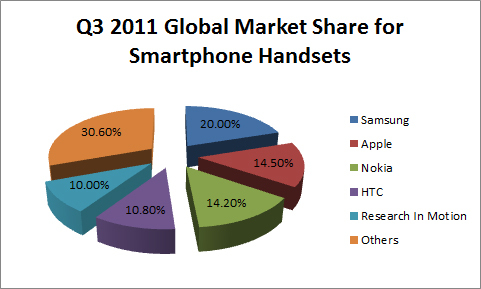 M&A in the mobile device market may go up because usage will increase and manufacturers will acquire relevant firms and assets to diversify into different markets and offer better user experience. However, traditional computing will have a place because of their superior power, compared to mobile devices, which is suitable for high performance applications, such as video editing, gaming and computer-aided design. Therefore, M&A is this sector may involve market consolidation and acquiring relevant assets and firms to allow manufacturers to focus on various niches. Cloud computing M&A activity will go up because of the rise in the usage of mobile devices means that there will be rising demand for users wanting access data at any time, from anywhere and from any device. Also, there will be more users who will temporarily need extra computing power for high intensive uses such as mathematical calculations for simulation and research. Global technology M&A will roughly follow global economic cycles of boom and bust because virtually all of the world’s economies, some say, [legally] allow private banks to create money at will through new loans. Also, the sector activity will stay roughly stable due to the ongoing trend of the entrepreneurial revolution where technology is increasingly replacing people in more jobs and disputing the society because the former can perform in them more efficiently at a lower cost. This mean that there will be a shift of power from the organisation to the individuals. Even some large firms are recognising this trend today. Bitcoin M&A activity will go up because the digital currency will be used by more people and businesses in the future once all of the problems have been resolved and firms in the market acquire relevant assets and firms to enable them to dominate their niches such as accepting bitcoin and converting them into national currencies like the dollar. Eventually, bitcoin may be a widely accepted form of currency alongside national currencies. 3D-printing M&A activity will increase because the more people and businesses will use them to manufacture their products, design and make one-off products at the consumers’ own preferences, make prototypes to test their products and iron out potential problems before formal launch at lower costs. Eventually, 3D-printers will be in most homes and businesses. This means that firms will acquire or merge with others to diversify into different markets, cater for different types of consumers and businesses and further improve user experience. Cloud computing, smartphone, social media and mobile device M&A activities will rise because more people and businesses will be connected to the internet through existing and new technologies, demand for these products and services will rise, especially in the developing economies. Therefore, deals will typically involve around improving user experience, innovation, developing new products and diversifying into these markets. Traditional computers may not be used in the long run due to improvements in computing power in mobile devices will result in high intensive applications such as complex photo and video editing may be possible. Thomson Reuters Mergers & Acquisitions Review Forth Quarter Review 2013 Note: Sources 2 to 8 can be accessed through Thomson Reuters Deal Making Intelligence website. This is my second short M&A analysis. This time I am going to analyse the takeover of Ralcorp Holdings Inc. (RAH) by ConAgra Foods Inc. (CAG). I will talk about the background of the deal briefly before giving my analysis of the transaction. The descriptions from both companies and the stated benefits of the transaction are based on the deal fact sheet (1). ConAgra Foods is one of North America’s leading packaged food companies, with brands in 97 percent of America’s households. Many of its brands are sold in grocery, convenience, mass merchandise and club stores. The company has a strong commercial presence, supplying frozen potato and sweet potato products as well as other vegetable, spice, and grain products to a variety of restaurants, food service operators, and commercial customers. Ralcorp Holdings is a leading manufacturer of private label foods, a major producer of food service products, and the owner of the highly regarded Post cereal brand. The company produces a variety of value and store brand consumer foods sold under the individual labels of various grocery, mass merchandise and drugstore retailers as well as frozen bakery products sold to in-store bakeries, restaurants and other food service customers. Additional details of the transaction are in this document (2). 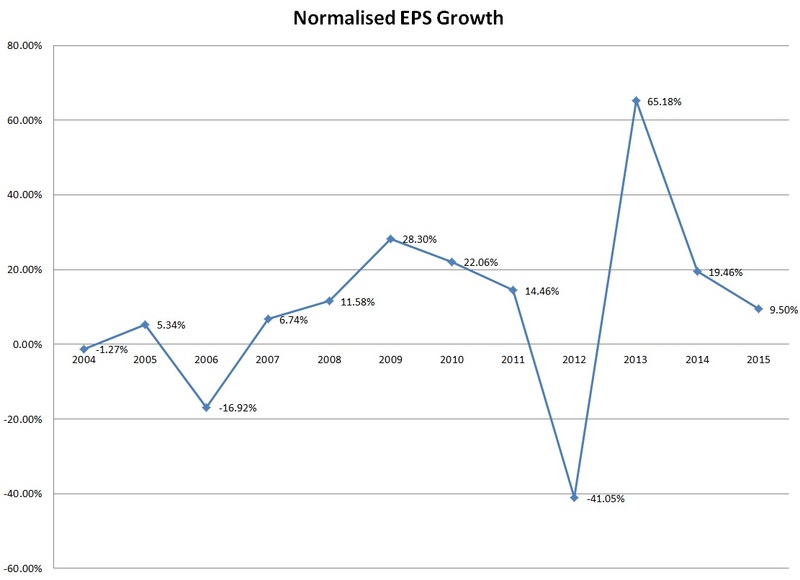 overall the firm has strong fundamentals as of at the close of 18/8/2011. 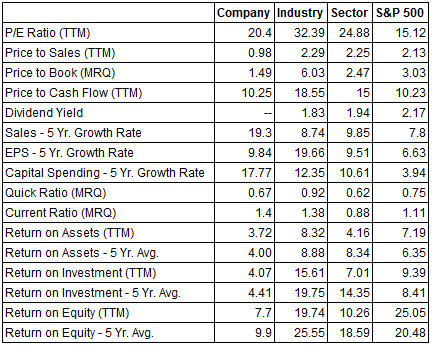 Most importantly, the price to earnings (P/E), price to sales, price to book and price to cash flow for the firm are below the industry and sector averages. These are also below overall market average, except price to earnings and price to cash flow. Current ratio is above 1 so the firm will still be able to pay all of its debts if recalled immediately. Return on assets, return on investments and return on equity ratios are a little disappointing compared to industry, sector and market averages. However, these are minor, in my opinion. Also the firm does not currently pay dividends. Table 1: Financial ratios of Ralcorp Holdings Inc. compared to those of the Food Industry, Consumer/Non-Cyclical sector and the S&P500 index (5). From my perspective, in addition to ConAgra Foods’ stated reasons for the takeover, consumers may benefit from this in terms of lower prices for existing products due to lower costs. Consumers in emerging markets which Ralcorp operates in would have access to products offered by ConAgra therefore they have additional choices. Note that the original offer of $82 consisting of cash and stock is not included in the analysis because the lack of information regarding the composition of the deal, that is, the proportion of the offer in cash and the remainder in stock. For the hypothetical offer of $100 cash and stock, I picked an arbitrary value of $50 cash and 2.0202 ConAgra shares for each Ralcrop share. The values used for calculating the weighted average cost of capital (WACC) are shown in this document. 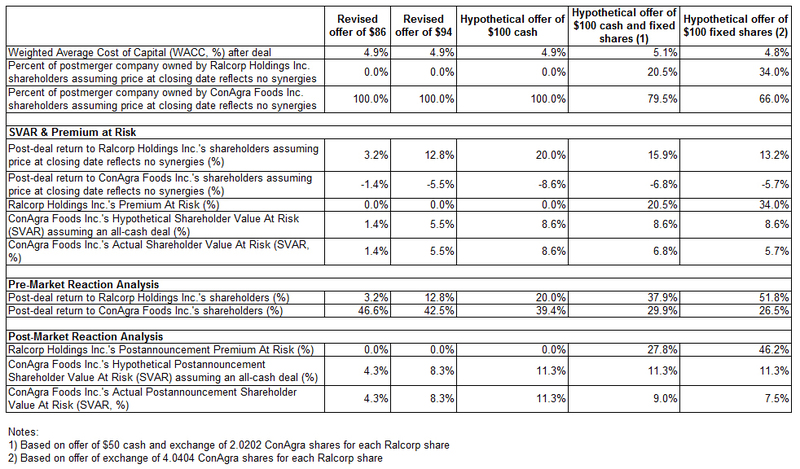 Table 2: Comparison of offers that ConAgra Foods Inc. could offer to purchase Ralcorp Holdings Inc. These do not represent a good deal for Ralcorp considering its good fundamentals overall and track record of delivering shareholder value. However, these offers do represent a very good deal for ConAgra. WACC for the combined company is 4.9% based on the market capitalisation of respective companies just before the announcement of the takeover. Under the Shareholder value at risk (SVAR) and premium at risk analysis, the higher the offer value post-deal return assuming no synergies are realised for Ralcorp increases exponentially whereas this gets worse for ConAgra. The latter’s SVAR also rises. Ralcorp’s premium at risk is 0% for all offers. Under pre-market reaction analysis, higher the offer, post-deal return for Ralcorp increases exponentially whereas ConAgra’s return falls almost linearly. Under post-market reaction analysis, Ralcorp’s premium at risk is 0%. Higher the offer, ConAgra’s SVAR rises. This does represent a much better offer compared to the cash offers since Ralcorp ends up with just over a fifth of merged firm whereas ConAgra would end up with just under 80%. WACC is 5.1%, which is the highest compared to other offers. Under the SVAR and premium at risk model, post-deal returns for Ralcorp if no synergies are realised is 15.9% whereas ConAgra’s is -6.8%. Premium at risk for Ralcorp is 20.5% and SVAR for ConAgra is 6.8%. Under the pre-market reaction analysis model, post-deal returns for Ralcorp and ConAgra are 37.9% and 29.9% respectively. Under post-market reaction analysis, premium at risk for Ralcorp is 27.8% and ConAgra’s SVAR is 9%. This deal is slightly more risky compared to the revised cash offer of $94. However, both firms would receive a fairer and decent amount of return if the deal goes well. Both Ralcorp and ConAgra would end up with good returns if the synergies are realised and strategies go their way. This offer is superior to the cash offers since Ralcorp would get just over a third of the combined firm whereas ConAgra receives just under two-thirds. This is the most equal of deals compared to others. WACC is 4.8% which is lowest compared to other offers. 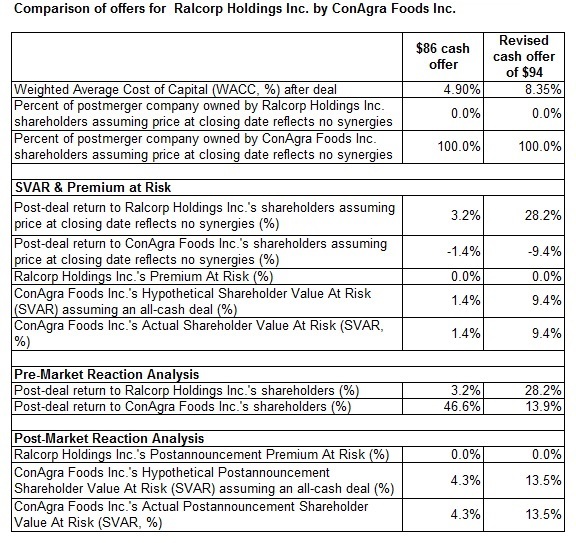 Under SVAR and premium at risk, post-deal returns assuming no synergies for Ralcorp and ConAgra are 13.2% and -5.7% respectively, premium at risk for Ralcorp is 34% and SVAR for ConAgra is 5.7%. Under pre-market reaction analysis, post-deal returns for Ralcorp and ConAgra are 51.8% and 26.5% respectively. Under post-market reaction analysis, premium at risk for Ralcorp is 46.2% and ConAgra’s SVAR is 7.5%. Ralcorp would end up with a very good return whereas ConAgra would end up with slightly worse one compared to $100 cash and stock offer. The former does take on more risk and the latter has a little less risk. Based on the analysis above, I would recommend that ConAgra should offer of $100 consisting of $50 cash per Ralcorp share and exchange of 2.0202 ConAgra shares for each share. This is because this deal would represent a good deal for ConAgra and Ralcorp, though the former would end up with a larger return than the latter, and WACC for the combined firm is just a bit higher compared to all cash offers. ConAgra would take a reasonable amount of risk for a decent return if the synergies are realised even though the amount is less than that of Ralcorp’s. The former would lose a small proportion of its value if no synergies. SVAR for ConAgra and premium at risk for Ralcorp is reasonable. Takeover of Ralcorp Holdings Inc. (RAH) by ConAgra Foods Inc. (CAG) – Weighted Average Cost of Capital. Sources used in this document are (5) to (13). As this is my first post, I will not analyse a M&A transaction. I will do that in my next post. Instead, I will briefly talk about the effects of the entrepreneurial revolution and social media on the M&A industry from my own prospective. You may be asking yourself this – What is the entrepreneurial revolution? The entrepreneurial revolution is a time where people are setting up their own small businesses therefore becoming suppliers of goods and services to consumers and businesses in the economy. The video below by Daniel Priestley explains this concept. Why does the entrepreneurial revolution and social media matter to the M&A industry? The entrepreneurial revolution means that we will see investment bankers will leave their jobs and set up their own boutiques specialising in their own niche. They will provide the same services as the bulge brackets at a fraction of the cost compared to the latter. This means that the boutiques can bring in the same amount of revenue as a bulge bracket while carrying less fat. This also means fatter profit margins for the former. Since these specialists can serve their clients better within their own niche compared to a generalist bulge bracket this means that the latter will be in trouble unless they form partnerships with the former. Social media is definitely changing the way how investment banks operate. We will see the investment bankers using social media to work together on transactions while still being subject to regulations. Prospectuses will be shared to shareholders and those interested in transactions. News of transactions would be posted after being vetted. Detailed analysis of transactions will be shared publicly. Therefore, the processes in the transactions will be more transparent. Putting the above two together, bulge brackets and mid caps have slim down to cut costs dramatically so that they can be very profitable. Investment banks will have to be more open [as the regulations allow them to be and without adversely affecting the share price of companies] and more supportive of their clients and other stakeholders [I’m not saying that they not in the first place].